Warm but dreary day and also windy since it's warm. Sigh. I decided on something from the archives today. 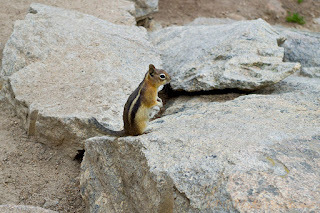 Here is a cute little Chipmunk that I was able to see and get photographs of as he stopped along his route to pose for me. I saw this little guy in Rocky Mountain National Park.